Behaviour is probably the most intense record I’ve ever immersed myself in, a beautiful, poignant and sophisticated recollection of adolescence, growing up, and moving on in life. As a teenager, you undoubtedly perceive things more intensely – especially if you feel that the author of a work such as this is speaking either directly to you or on your behalf. I was 18 when Behaviour was released, and I don't think it's a coincidence that I feel this album more deeply than any other. From the understated artwork to the sombre melancholic tone, everything seemed very deliberate. From the black and white videos to the quotation on the cover of the second single, there seemed to be a guiding hand of supreme craftsmanship at work painstakingly sculpting and shaping a unique world that listeners were drawn irrevocably into, lost forever. Behaviour seemed to contain life's secrets, recounting as it did tales of growing up from the perspective of somebody who had once "found inspiration in anyone who's ever gone and opened up a closing door." This must be the place even took the 18-year-old me, fresh out of school, right back to the scene of much teenage misery, when really all I wanted to do – and was in the process of doing - was take that haversack to the station. So, to my teenage ears, this was a profound record, a collection of secretly shared wisdom where Neil Tennant assumed the role of guiding light, somebody who knew what it felt like to leave home and try to make it in the big bad world – a world of possibilities, excitement, and opportunity. Behaviour was, therefore, a journey, a survival kit for those of us on the cusp of adulthood with our heads full of hopes and fears. From the effortless cool that surrounded lead single So hard to the sense that this was a seminal record by the greatest band of the day, Behaviour’s commercial underperformance simply added to the claustrophobic atmosphere that I was now part of a cult rather than a mainstream movement. I'm surprised people thought Being boring could ever have been a hit. Even in 1990, I was sure it wasn't at all commercial. There was nothing - other than So hard - on the album that was in the same disposable class as what went before. Their time in the sun was probably up regardless. It took hugely OTT covers and funny hats to get them back in the public eye over the coming years. Image-wise, they returned with a rather severe look – all angular shoulder pads, tight haircuts, puffa jackets, and frowns. And all in stark monochrome. They seemed almost, unconsciously, to represent the past – or at least something very serious. The lyrical wit of So Hard, the desperate but hilariously biting U2 satire, songs about the communism of the classroom, ageing regret, and the passing of time, not to mention the impending sense of commercial doom, all contributed to the intensity of the era. To then put this world onto a stage a few months later in Performance was preposterous. We were now entering three years of artistic genius. Behaviour contains not only some of their greatest melancholic moments, but also one of their very best broken-hearted love songs (To face the truth), and started the process of Neil's lyrical coming out. Nervously, subtle and elegant, was as direct as he'd been on record up to this point and heralded the diminution of code in favour of sincere romanticism. Behaviour might have taken us teenagers on a journey, but it was compelling because it was also taking Neil on his. Here was a lyricist worth following – and how we followed him, to the extent that we are still trailing eagerly behind nearly 30 years later having experienced so many of the emotions he described in vivid detail to us on this record. Rented rooms, foreign places, the loved ones we've gloriously met, and those we have desperately and lamentably lost...in spite of dreams. Life's amazing, isn't it? And this is its soundtrack. A manifesto for the disaffected, I lapped this up as a teenager. Behaviour was a survival guide, and here Neil presented us with "a new approach found to the meaning of life." This song is petulant in the manner of a teenage strop, but underneath the surface it can be construed as a slightly disturbing song about depression. For this reason, I find it darker than maybe it was ever intended to be. One of a number of b-sides in this era that was almost as good as the concomitant a-side. 9. Was it worth it? Neil's coming out single, where they employed the kitchen sink in a vain attempt to write a hit. Drama, energy, thunderclaps, call and response chants, and false endings couldn't get this into the top 20, but it's almost a manual on how to produce a fabulously hooky single. I've always liked the single-minded defiance of Was it worth it, but we're a long way from the acerbic cool of Left to my own devices now. Another classic b-side where we are vividly taken, once again, into Neil's youth. There's a lot of pent-up emotion in Neil's past, it seems, and this track is quite striking in its portrayal of Neil as an unlikely companion of the most attractive girl in school. There's a vivaciousness about this track, an energy and bubbling intensity that drives the story along as Neil, under attack, snatches a small piece of haughty revenge in a world where he'll never truly fit in. 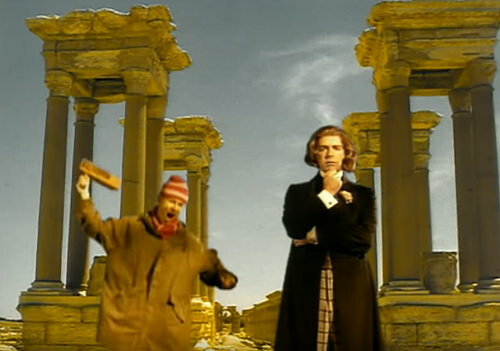 To Face The Truth was, and still remains, my absolute nailed on favourite PSB moment. It’s the song I tell people to listen to when they say “I Don’t Like PSB”. No song on Behaviour distills the sound of the album quite so purely as this elemental vignette, a tempestuous tale the lends itself to multiple interpretations. The protagonist's state of mind is reflected in the elements, and one wonders what he's really covering up and whether the autumnal storm sweeping through his life is more psychological than meteorological. Neil's vocal performance deserves a special mention here, his enunciation is beautiful and the tremor in his voice perfectly captures the nerve-wracking trauma hinted at in his words. If they began with Behaviour and in 1992, they would never write West End girls or Suburbia, or Heart, but… Even if they would - those songs would sound different. But it would be more interesting. If they began in 1990 or 1991 they would write something more progressive and heavy, because that was a time when people loved a new music. Snap, Prodigy, Nirvana. 1993, their Very would sound more powerful. I imagine if their first album in had Miserablism, DJ Culture, Forever in Love and Only the wind. It would be released in 1992. That would be cool. Maybe they would be more interesting for people as Massive Attack those days. A striking intro, a glorious middle section, and a Tennant monologue for the ages - but what the hell was he on about? Talk about oblique. This is the exact point where they lost their Midas touch, their deep understanding of what disposable pop music was all about, and yet they managed to put out an engrossing minor epic of a single that seems as paranoid and disdainful of everything as it is hard to fathom. I remember hearing this for the first time on the late, lamented Century Radio in Ireland in October 1991. The DJ trailed "a new single from the Pet Shop Boys after the break" and, sure enough, I was soon assailed by its dramatic and stark French-language warning and an immediate sense of recognition and excitement. Sonically, this is harsh on the ears, insistent and almost industrial, but there's loads going on as Neil takes centre stage with his pithy observations on the state of the world or whatever it was that was preoccupying him at the time...because, in truth, his ruminations don't exactly scream "universal experience" - and, of course, going against the grain never does. Being uncharitable, you could describe this as a poor man's Left to my own devices, but the verses here compose a glorious contrariness - and the sudden middle section, replete with defiant rejections of Catholic ascetism, is a tour de force demanding your immediate attention. It's the chorus that lets it all down. "Living in a satellite fantasy" is the best description of Sky News, still relatively new at the time, in their catalogue. The tone of this record mirrors how out of step they were with everything at the time, but they've made a career of being outsiders and of lacerating any cosy consensus by dint of simple critical observation. The video remains a career highlight, humorously summing up so many of their key facets and characteristics. To me, DJ Culture is a fantastically rewarding track that would have semi-mythical status had it remained an album curio or an obscure b-side. As a single, it made no sense, saying what it wanted to say in the most convoluted way possible, something some of us are clearly all too guilty of from time to time. The video remains a career highlight, humorously summing up so many of their key facets and characteristics. DJ Culture video is an absolutely brilliant slice of their "Performance" ethos of the time. One of their best. The track is intellectual Neil at his finest, and the whole thing threatens to come crashing down in over-produced glory. But no, I'm still not even sure what the song is about. Wasn’t it about the 1991 gulf war ? Dance with me, let’s pretend living in a satellite fantasy, waiting for the night (war) to end. They compare that broadcasted war with a football match and so on...that’s what I understood back then. 'Behaviour' is one of the most perfect albums ever made. DJ Culture is a brilliant single but it was never going to be a smash hit. It's far too strange and understated with a beautifully sad chorus. I was just always underwhelmed by DJ culture - I love the Grid remix , but the 7" was just sort of too compressed and sort of messy. Not sure why it never stuck for me. It might be the vocal. Neil sounds a bit bored, and it's too wordy. I think. The extended mix is certainly far better. Behaviour is an autumnal album. You can classify the previous albums as: being young and initially discovering the city and its nightlife (Please); having relationships in the city and experiencing the vagaries of Thatcherism (Actually); and the dancefloor within the city's throbbing heart (Introspective). But Behaviour feels neither urban nor contemporary - it is instead filled with ghostly echoes from the past and the melancholy chill of the leaf-laden forest floor in mid-November as the trees are falling down. It's the album I will always return to eventually, partly because like Drico I experienced it for the first time when I was young - https://www.youtube.com/watch?v=FpPSF7-Ctlc - but also because life is invariably more about Veil'd Melancholy than Joy. Relationships fall apart, our loved ones all die and Being Boring gets to number twenty in the charts. It is their masterpiece but I'm glad that the other euphoric side of PSB exists in spades too. It's just nice to wrap Behaviour around oneself when the melancholy fit falls sudden from heaven like a weeping cloud (thank you, John). The fruit of their earliest successful collaboration, Jealousy is Behaviour's grand, sweeping closing gesture - and one of their superior 1990s singles. Even at their most subtle, they cannot resist going over the top, but the swelling crescendo here mirrors the psychological state of our paranoid protagonist as he realises and then accepts that his worst fears have come true. In many ways, this song is very underrated. It stands up melodically and lyrically to much of their best work and, perhaps, suffers only for the fact that it lacked the brash hilarity of the U2 send-up that preceded it and appealed to the same critical constituency as Being boring. There's an argument that Jealousy would have been the second single - and, indeed, a better second single - had Being boring remained as an album track. It superseded Being boring on the chart when finally released, but by then most of us had moved on, lusting for new, exciting, vibrant material. The video unwittingly revealed one of the reasons for the commercial decline Pet Shop Boys were now slowly undergoing: Neil's badly-dyed hair drew more attention to his advancing years than thinning out or going grey ever could. But the single, now with full orchestra, also showcased just how essential they were at this time, containing as it did not only the neatly reworked 7", but a demo of Losing my mind and the fantastic extended version of This must be the place I waited years to leave - as seen in Performance. Exploring Dublin the morning after the final Performance show, my brother and I bumped into two schoolmates of his who he had no idea were Pet Shop Boys fans. One of them lamented that he'd spent so much money on merchandise that he had nothing left to buy...West End Sunglasses on CD. Clutching the newly released Promotion video and my Jealousy single digipak, I marvelled at the secret appeal of Pet Shop Boys and how much they must be loved for anybody to want to buy West End Sunglasses. The shop where he could have bought that - the Virgin Megastore - no longer exists. Like the poor, Pet Shop Boys are still with us.